Home / Volkswagen / The XL Sport. Why ‘Bluemotion’ does not have to be boring. It was during the March WoB Trip that I sat in the XL 1 concept. This 2 cylinder diesel/hybrid plug in was designed to achieve 0.9 l/ 100 km, using lightweight materials like carbon fibre reinforced polymer (CFRP) and a streamlined body with a 0.189 coefficient of friction..
With an 800cc TDI engine capable of 48ps and an electric motor generating up to 27ps, this 795kg car could also top out at 100 mph on a limitless Autobahn. A limited 250 of these vehicles were available to 200 customers at a price of 115k Euros. Well there is now a ‘sporting’ version. Click on the link provide to read more! 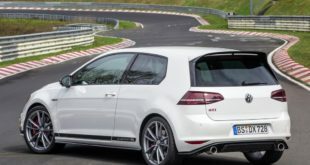 Previous The Golf 420R will be a reality for 2015! Next What do you get as a Paid Member of Club GTI?